I was lucky enough to stay at the hottest new hotel in Dubai, the Five Palm Jumeriah last month. The cosmopolitan five-star resort definitely lived up to its expectations. After opening in 2017 the Five Palm has been a big hit with celebrities and the Insta-famous with on-site pool parties, rooftop bars and restaurants as well as its own private stretch of beach. The hotel overlooks the Dubai Marina skyline and Arabian Gulf and is located only 15 minutes drive from Dubai Marina and 20 minutes from Downtown Dubai. The style of the hotel is exactly what I look for when looking for a luxury stay/baecation. As soon as you walk through the doors the golden, marble, glass design oozes elegance. You can't help but be drawn to the row of palm trees that encapsulate the glistening infinity pool, and the fact that everybody just looks so relaxed and happy. THE ROOMS | My room type was a Junior Suite City View (not a sea view room unfortunately but there is quite a dramatic price difference for this upgrade!) 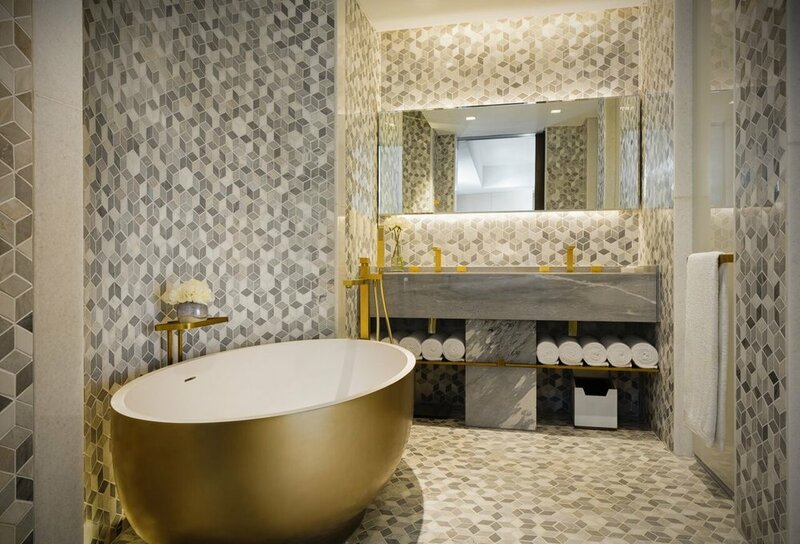 The room was like something prepared for a Greek goddess, complete with a mini living room, sun loungers and seating on your private balcony, a walk-in wardrobe, a massive comfortable bed and a luscious golden bathtub. Check out my IG story highlights for a room tour! THE POOL | The pool is the perfect place to spend your days at FIVE Palm Jumeirah, taking a refreshing dip to cool down from the high temperatures is a necessity and there's an Ibiza/Miami vibe at the pool. Music is constantly played, they also have DJ residency's and pool parties where it becomes a sort of beach club on the weekends. 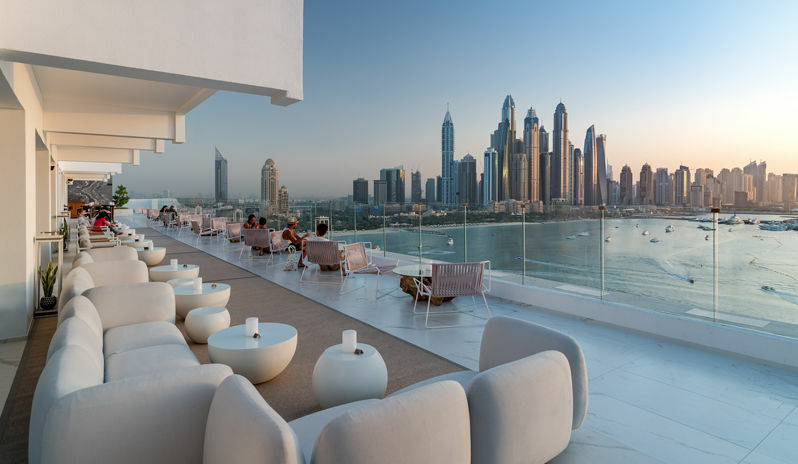 THE ROOFTOP BAR | The Penthouse Dubai on the 16th floor is a lively adults-only rooftop day club and evening lounge with amazing views of the stunning Dubai skyline. The rooftop bar also has two glass-lined swimming pools where they throw parties on the weekend. It's a great place for an after-dinner drink/shisha and is open until 2am on weekday nights with different events happening each night. If you love to watch sunsets it's the ideal spot overlooking the Palm for this too. THE FOOD | I only experienced breakfast at FIVE as I love to get out of the hotel and try all of the different restaurants. The breakfast usually comes with the room although you can add it after or order room service breakfast for an additional charge. Personally, it didn't blow me away, and although the portions are generous, it can be quite costly if you're adding it on after. THE SPA | I didn't use the spa, but of course, I had to have a look and it looked like the ultimate relaxation spot. They also have a deal currently which includes a 45-minute massage, a dip in the outdoor hydrotherapy pool and a three-course lunch for only AED 499, which is just over £100. Not bad at all. HOTEL HIGHLIGHTS | The look of the hotel is a highlight in itself, as well as the attentive and friendly staff. You really feel at home at the FIVE Palm. PRICES | From £116 - £548 per night. You can usually find the cheapest prices when booking through Trip Advisor, check it out here! Flights to Dubai from London can start from as low as £250 return, check Skyscanner for the cheapest!